Saif Ali Khan got word ‘Kareena’ tattooed on his forearm, this buzz has been going around for while now and finally got confirmed with Saif’s actual tattoo. …otherwise Saif will find it very awkward going around with someone else with Kareena on his forearm. Here is close look of Saif’s Kareena Tattoo. Saif is not alone in tattoo gang, Esha Deol got 2 tattoos and even Malaika Arora Khan got one tattoo. 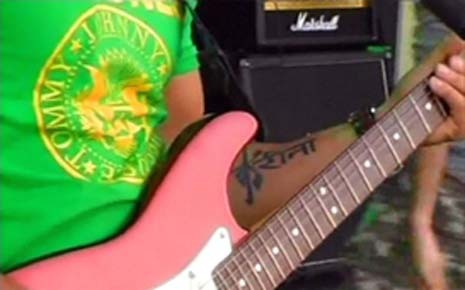 This Saif tattoo image is a TV grab from CNN-IBN via, while heÂ was on tour for a concert with rock band Parikarma.